Since its founding, we at Budget Blinds of the Lowcountry have proudly served the local community by offering high quality and stylish window coverings for any occasion. Our goal is simple: to provide you with the best products and services in order to enrich your home environment. Our lavish selection of window treatments includes shutters, blinds and shades. Regardless of the window’s size or shape, you can rest assured Budget Blinds Serving of the Lowcountry will have a customized window coverings solution ready for you. Please call us today to schedule your free in-home consultation. We’ll bring you the highest quality and most fashionable window coverings in of the Lowcountry and surrounding areas. Looking forward to helping you beautify your home! The best in STORM PROTECTION, SHUTTERS, RETRACTABLE SCREENS & ENCLOSURES Since 1996, we have built our company on a reputation of professionalism and an unmatched level of customer service within the industry. All of us at Armor Building Solutions stand behind our work and are confident that we provide customized high-quality storm protection, shutters, retractable screens and enclosures. In addition to great service, we believe an educated customer is a great customer. We will answer any questions to ensure that your project is an enjoyable one – from concept through completion. To ensure customer satisfaction, every job we undertake is personally inspected and approved by the owner of Armor Building Solutions upon completion. We look forward to providing you with a product that meets your every need and surpasses all of your expectations. Trust your next project to the Armor Building Solutions family. Your home provides more than shelter. It is your retreat, a place where you find peace, comfort and most importantly - family. And Armor Building Solutions is not just a manufacturer. We’re a full-service company that designs, manufactures, installs and provides warranty service after the sale. Our customers receive the highest quality of products at the lowest possible price because we manufacture and offer our products directly to the public. In 1987, successful window treatment designer Carlette Cormier started the business to help support her family. With a small toddler at home and her husband recently laid off Carlette needed employment that would not only allow her to contribute income, but to be at home to care for her family. Deciding to rely on the skills taught to her by her mother since the age of five, she began CC’s Designs. At a young age she learned to sew doll clothes and over the years Carlette has continued to develop her skills alongside her mother. After moving to Savannah, Georgia to look for employment, a friend who worked in a wallpaper store recommended Carlette to a local designer who came into the store inquiring about help with some window treatments. After seeing the work Carlette had done in her own home, the designer was sold and thus began CC’s Designs and a new career for Carlette was born. Despite the fact that Carlette was new to the area and a complete unknown, her reputation for creating beautiful window treatments spread quickly. Through word of mouth advertising, the small business with humble beginnings evolved into an award winning design and fabrication company. Services include the design and installation of window treatments, beautiful bedding, canopies, upholstered walls and ceilings and much more. CC’s Designs can now confidently make the claim to be a one stop shop for all your window treatment needs as it continues to be family owned and operated. Attributing much of her success to the continued education she has received by attending trade shows and conferences, Carlette now attends as an instructor, to help other up-and-coming designers and fabrication studios learn from her experience and talent. Her continued efforts to build on her talent have had rewarding results. *Hunter Douglas Authorized Dealer* LowCountry Blinds & More has been doing quality blind and shutter work in the area since 1999. We carry a wide selection of window treatments, including Hunter Douglas sheers and shadings, honeycomb shades, Roman shades, roller shades, screen shades, shutters and blinds. We are the LowCoutry's blind and shutter pros! We offer more than great products— Whether you are shopping for a single window covering or redecorating your entire house, we have great people with the knowledge and expertise to help you put it all together. LowCountry Blinds & More is proud of the professional products and services we provide and take our long-term commitment to the community seriously. We are here now, and we'll be here in the future, when you need us again. Check out our 2nd Quarter Promotions! We are a locally owned and operated business since 2008 that strives on customer satisfaction. Phelps Enterprises is a locally owned family business. Since we offer a Shop At Home Service, we pride ourselves in bringing each client our personalized time and service. Their are many exciting options for each window, let us show you them! We represent the 5 leading manufacturers of window treatments. Hunter Douglas, Lafayette Window Fashions, Graber, Norman, Carole Fabrics. If your looking to add warmth and color, we carry over 10,000 fabrics for your drapery, valance or cornice selection. Our drapery selections include Ikats, Diagonals, Quatre Foils. Please view a 2 minute video presentation all about Carole Fabrics on You Tube, put in Carole Fabrics 2018 Promotion. We have the most current fabrics on the market. And if you need hardware to hang your draperys on, we have a selection of hardware as well. Including Metals, Wood, French Rods in every color! We know everyone has a budget and we work hard to keep you within it. At Phelps Enterprises our motto is "When It Has To Be Gorgeous!" For several years Carolina Window Designs has been working with interior designers creating beautiful window treatments, bedding, custom chair and bench seat cushions, unique upholstered headboards and beds. Our high standard for professionalism and customer service make Carolina Window Designs stand above the rest in reputation and quality. Pride, dedication and commitment to excellence from initial consultation to installation and further provide unsurpassed quality and professionalism. Our staff meticulously hand crafts each product with a commitment to excellence and attention to detail. Our installers are experienced, courteous and respectful of each home they enter. Their attention to detail is unmatched by any installer in the area. We work with designers and decorators in the Hilton Head area to transform concepts into a reality that will impress and delight for years to come. For every product is hand crafted with attention to detail. Our one-of-a-kind window treatments add personality and ambiance to any room. Since we're locally owned and operated, we take our long-term commitment to the community seriously. We are proud of the professional products and services we provide. We are here now - and we'll be here in the future when you need us again. Call on us for your next design project! Home interior store and workroom, established in 1998. We craft our own custom bedding, draperies, and home accents with unbeatable prices and quality. Our retail store features designer fabric by the yard, bedding and bath essentials, linens, furniture, and home decor. Now an authorized Hunter Douglas Dealer! Located on beautiful Kiawah Island, South Carolina, we serve Charleston and the surrounding areas. We are locally owned and operated. A Classic Touch Draperies is co-owned and operated by Monique Gathers and Amelia Lafleur. Together we carry over 60 years of experience in custom drapery work and home decor fabrication. We are young and energetic with fresh ideas for whatever your personal style may be. Our work will complement your home to its fullest regardless of the job. We produce only professional quality work at very competitive rates with little to no wait time. No job is too big or too small. The right window treatment can make or break a room. 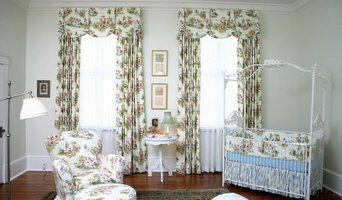 But here in the sunny Charleston, SC area, window treatments have to do more than just look good. They have to be practical, blocking out sunlight when it gets too warm and letting it in when it gets too cold. They have to be perfectly tailored to ensure that you get UV protection when you need it and you can enjoy the view when you don’t. At A Shade Above The Rest, the perfect window treatment is exactly what you’ll find. Whether you’re looking for plantation shutters, window blinds, or shades, you can trust us to help you find the window treatments that will work best for your room. Let us help walk you through the many choices we offer so that you will find a window treatment that is both stylish and practical. A Shade Above The Rest is a family business, run by cousins Sam Wood and Mike Van Axen. Together, they have over a quarter century of experience in the window treatment business. From taking accurate measurements to helping you make smart choices, they know everything there is to know about window treatments. Best of all, at A Shade Above The Rest, we bring our family values to work with us every day. We believe no job is too big or too small. Our customer support is top of the line and we will try to work around our customer's schedule to meet your decorating needs. Whether you are a professional designer or do it yourself, we can help you with your designing and decorating needs. Genie and her staff have over 80 years of combined experience in the drapery business to help you with your designing needs. Genie Prentiss Craggs personally has over 40 years in the drapery business, Debbie has over 30 years experience and Sondra has over 10 years. Let us put all our design experience to work for you. We specialize in custom window treatments for the discerning customer. 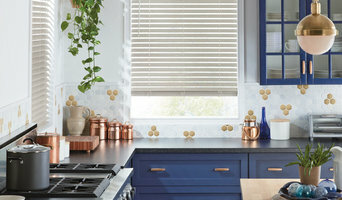 Budget Blinds of Savannah is a locally owned and operated franchise. We offer custom window treatments for residential and commercial projects, and can provide you with references upon request. Whether it’s simple, affordable coverage you’re looking for or something designed to make your home a showplace, we’ve got you covered. We offer a complete range of products to fit your needs and budget. 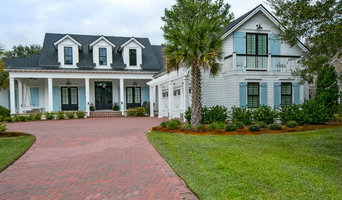 Based in beautiful Savannah, Georgia, Palmetto Shutter Company is a local, family-owned, custom shutters, blinds, and shades retailer serving the Georgia coast and South Carolina low country, including Savannah, Saint Simons Island, Bluffton and Hilton Head Island. We are the area's best source for top quality, custom window treatments with an unmatched reputation for outstanding products and exceptional service. With Palmetto Shutter Company, you get a custom-built shutter made by skilled craftsmen every time. Whether you are covering a standard size window, French doors, arch top windows, or another type of specialty opening, our plantation shutters are handcrafted to fit your exact measurements and make a lasting impression. At Palmetto Shutter Company, we’re much more than plantation shutters. We offer a complete line of blinds and shades, including wood blinds, faux wood blinds, aluminum blinds, vertical blinds, bamboo shades, honeycomb shades, woven wood shades, roman shades, sheer shades, solar screens, and pleated shades. We are proud to offer the complete line of Hunter Douglas window fashions. For the exterior of your home we offer a complete line of shutters, including raised panel, recessed panel, flat panel, fixed louver, Bahama, and board and batten. We also offer an extensive line of quality hand-forged hardware and accessories to make your exterior shutters operable or give your fixed exterior shutters the appearance of operable exterior shutters. We have been in business since 2007 with one simple mission and that is to deliver products that our customers are eager to recommend while providing exceptional customer service – even after the sale. On every job, large and small, we personally see to every detail – from taking accurate in-home measurements and custom color matching to expert installation. What makes us different is that we are a local company which means we call the shots to ensure that every customer becomes a happy repeat customer. Unlike national chains, we have the freedom to make decisions and respond quickly to our customers' needs and what the market tells us. Our customers will tell you that we are passionate about our business, that we make things as simple as possible, and that we go the extra mile to ensure complete satisfaction. Today we are proud of the reputation we have developed across the Savannah, Bluffton, Hilton Head Island, and Saint Simons Island area. SolBloc Window Tint offers window tint to help lower your electrical bills, protect you and your family from harmful UV rays which cause skin cancer and cataracts, protect your flooring and furniture from fading, and reduce glare. To keep you safe, our highly trained staff always arrives at your home in a clearly marked company vehicle, wearing the SolBloc Window Tint uniform and ID badge. We sell Huper Optik window tints and films, a German engineered product, which is the highest quality window film on the market. Our tints come with a lifetime residential warranty and 10 year commercial warranty.